All things bike, fer sale, dude. Come get some. Complete Bikes, Frames/Forks, wheels, many, many parts - all priced to move. Come get that rare bit to complete your latest project, or start a new one. Go ride the JCBC Spring Classic, and then come by and get a deal. Cash only. I might have coffee... not sure yet. It's back, and under new management: join up, soldier, and (uh-rah...) get ranked. Navigate back to my main page, and hit that link, ace. They say that if you rub the silver too long, the shine will come off. Others might say that there is a fine line between appreciation and the doldrums of excess. The same vacation year-after-year can become boring, in an otherwise un-boring locale. The luster of a new boutique wears off after a few months. And, yes, cycling the same route to-and-from work each day can lead to boredom and burn-out. Yes, even the most passionate cyclers can have their lust hidden beneath a cloak of replication after a time without rest. It’s the resting, the recuperation, and the forgetting that keeps the passion alive. It’s an oft-told tale of absence against the weakness of one’s heart for its aspiration. It’s not complete hog-wash, after all. A victim of several cases of rampant burn-out last season, I have walked carefully out of the darkness this winter and back into the light of a new season, rife with possibilities and the pledge of a clean slate. A recent pre-dawn conversation about a cyclist that I respect revealed that quantity indeed does nothing to take the place of quality. Someone I had assumed was logging far more miles than myself was, in truth, not. Even in the pitch black of that foggy morning, the lights came on in my mind. You all have read here as I waxed philosophical about ‘less’ being ‘more’, and these few months later, it’s becoming truth. Rested and practically itching to get back on the saddle for the daily grind, I am fresh, ready and packing the Carradice for the jaunt to work in the morning. With mid-50’s forecast and a strong tail-wind in store, I can’t wait to rise before the sun and rifle northbound to the office. But, something deep inside told me that waiting until tomorrow morning would not be good enough. Last night, the spark was hot, and not wanting to wait any longer after (gasp!) nearly seven straight days off the bike, I took the chance at a cool night with very little wind to just get OUT on the bike. No destination, no pre-determination. 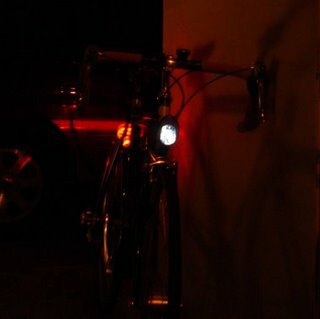 Not even bothering to “suit up”, I grabbed a wool cap, cuffed my jeans and hopped onto the bike with the best lights, taking to the streets in a flurry. Frantic to escape, I gave chase to possibilities and began to leave the houses and late-home-from-work drivers behind. Several dozen pedal strokes, and I was leaving the gentle cushion of the street-lit residential maze, plunging headlong into the darkness of rural Kansas. The moon was high, casting its eerie, bluish glow on the pavement, as my headlight filled in the gaps between, like whitewash running down an endless black canvas. The grey cast of the grass, the muted colors, the shadowy trees, and the blanket of stars thrown like a pin-holed tarp over the vastness of the sky. The whirr of my trusty tires against the pavement punctuated by a rustle from a rabbit in the ditch, and the lonely howl of a train whistle piercing the drone of wind-noise in my ears. The squint of the eyes adjusting to new headlights popping over a hill a mile ahead, the whines of approaching tires – which sound so different at night! – and the charge of air as white light turns fast to red, and then to nothingness – silence again, alone on this faceless, nameless country road – me and my bicycle, under the moon, moving as one through the night like a child chasing dreams that the sun had scared away. Miles away, I come to a stop sign, and follow it’s direction – a simple pause, alone in the dark at the crossroads of two slabs. Lights, in either direction, posing no threat, but I wait and take it all in; the coolness of the spring night’s air, the buzz of a light airplane overhead, lights flickering, and I turn around to see the ominous over-glow of the lights of the suburban city from which I’d fled. With the tug of my wool cap over chilled earlobes, a click, and a gentle push, we rolled across that intersection, further into the perfect night. There was silver to be polished. It’s frustrating being a ride leader sometimes – you plan, and ponder the route, the mileage, the logistics of it all, and sometimes no-one shows up. Then again, there are times like today. With only about 48 hours notice, I managed to drag together a pretty good group of riders for a quick and enjoyable ride to Baldwin City, KS., on this fine, first day of April. It was a rare day, indeed, as the sun rose to a brisk 43 degrees and brilliant spring sunshine. The skies were crystalline, and the roads were beckoning. I arrived at Oregon Trail Park to an empty parking lot, but I was early – a few minutes pass, and Krishna and Akil show up – I hadn’t ridden with them since probably before the end of last year! We unpacked bikes, pumped tires, and talked about the day and the route. Then, out of the blue, Bill shows up, too! I had only ridden with Bill maybe once or twice, many moons ago, still – it was great to see him, and he announced that a friend of his was coming along, too – shortly, his friend Robert did show up, along with Jim, who just recently started coming out to the rides this winter. This, for me, was a surprisingly good showing! Talk ensued, bikes shown off, and eventually we rolled out. It was, as I said, shaping up to be a fabulous day in the saddle, as the sun took hold and the temperatures started to rise a little. We headed west, with a slight tailwind, and down the first couple of steep rollers on 143rd St, eventually sliding past Olathe Lake and a couple Mallard ducks floating along in the morning sun. The water was almost glass-still, save for the ducks wakes. The gentle whirr of chains and wind noise was the only other sound – like a moment from a movie, almost, as the road pitched upwards and angles to the left onto Lakeshore Drive – not to be confused with Chicago’s Lakeshore Drive, Jim pointed out – little hillier here. Slowly the pack widened out as the climb continued, and eventually we were onto 151st Street, and back heading west with the new sun at our backs. Bill was setting a solid pace, demonstrating to me the brutal efficiency of the fixed gear bicycle as he consistently held speed on the long flat section of shouldered road, with Robert on his technically fantastic Ice Trike from the UK. Low, fast, and loaded with gadgets, it was a feast for the eyes in the sometimes hum-drum world of bicycles – let’s face it: ever since the introduction of the “safety bicycle” at the turn of the last century, there haven’t really been any major design changes – materials, yes; number of gears, yes; but complete and utter design re-thought, not really. Things like recumbents and trikes have always caught my eye, simply from a “let’s start from scratch and build a human-powered vehicle” point of view. Fascinating, and wicked fast on the downhills. Jim caught up, along with K-man and Akil, and we ventured off after Bill and Robert, already well up the road. Jim took point and, defying his own self-deprecation, set a marvelous pace which closed some of the distance to the leaders. It’s always been curious to me how the one’s that SAY they’ll be at the back, may times aren’t. We are our own worst critic – I know *I* am. The splendor of the day continued as the tailwind helped us over a few slopes, and onto the really rural part of 151st St., past the oil tanks and pumping fields, past the farm houses, and dream-houses of the opulent, and past the endless fields of brown, green and purple. With the deep blue skies overhead, it was the sights of the day that were really taking center stage out here. From cows to old uncapped grain silos, small creeks, and even the spookiness of the Sunflower Army Ammunition plant’s double fence-line, the sights were endless. Everyone was out enjoying them – two wheeler’s abounded, with motorcycles zipping up and down the rural roads, soaking up April’s first weekend glory. It was a good time to be out in the air, no matter what the method. After several miles, our group had splintered off into two groups; Bill, Robert and myself at the front, K-Man, Akil and Jim a little ways back. As this usually happens, it was a good thing that the majority of the route we were riding was marked – unfortunately, as we’d learn later on however, not ALL of it was. We three made our way west, into Douglas County, past a couple huge fields and the tractor graveyard near county-line road. At this point, I took stock of myself – the new bike was working perfectly, everything dialed in and seated properly, the new seatpost feeling every-bit as comfortable as the old one, and the pump strap had successfully solved yesterday’s rattle issue. The only outlying concern I had was the saddle height. Having JUST switched to the Brooks saddle on the Bianchi, I was once again on sketchy ground – not only was the saddle new, but so was the seatpost, and so too was the frame that seatpost was going in to. Things that are usually locked in stone, like saddle angle and fore-aft position, were suddenly careful exercises with the measuring tape and magic marker. I got it pretty close, but there is that old adage: if it doesn’t FEEL right, it probably isn’t – and my knees were telling me the saddle was too low – after all, I had basically started over with a completely new bike, so I expected some tweaking. After experiencing first-hand the recent fateful tale of the Hammer-meister, Del, I was not willing to take any liberties with my knees at all. I raised the seat a few millimeters, and here I am today – feeling slightly better about things. However, this ride is longer, and hillier. We turned onto DG-1061, which instantly pulled me back a month to the 200K that took us down this same road – but today we had a different path in mind and turned west again on DG-460, which is a great piece of road. Winding westward through the eastern half of Douglas county, the scenic views along 460 are really worth the trip, with endless ribbons of pavement, and occasional big open valley views of the west. Today, for the first time in a while, there was no fog, no haze to mask the view, and we came over a rise to a marvelous and endless vista of fresh green fields and farms, and were further rewarded with a 2-mile long downhill. These are the moments that only a cyclist can understand. We rolled on, passing thru Vinland, KS, where an old porch-hound gave chase for a good piece, making me wonder for a moment if I had enough leg to get away from him! Fast old dog – lucky for Bill and Robert I wore him out, because by the time they arrived at the same location, the old hunter had slinked back to his porch to rest it off. Robert was thankful, because on his Trike a dog chase like that can end rather badly, considering he’s only a few feet off the ground! Bill was not as concerned, but still – all cyclists prefer not to have a dog chase, if given the choice about it. After passing the hangars of the Vinland Aerodrome, we proceeded south onto DG-1055, which heads straight into Baldwin City by way of a really good grunter of a hill. At least one mile, maybe more, long, this brute of a climb passes over an old ridge of hills that basically hides Baldwin City from the rest of the county to the north – you know it’s a big hill when it has two water towers at its peak. This is the highest point for miles around. Unfortunately today, as we found out later there was a major auction happening in town, so traffic was heavier than normal, which is a reminder to me to check the county calendar before taking a ride onto one of these roads – sometimes, you just can’t plan these things. Traffic was steady, but still no worse than a typical weekday in the “kill zone”, as I call it, back in suburbia. Eventually we were up, and over, and pulling into the safe haven of the Kwik Shop at US-56 and DG-1055 in Baldwin City. It’s a sight I can never seem to get over. 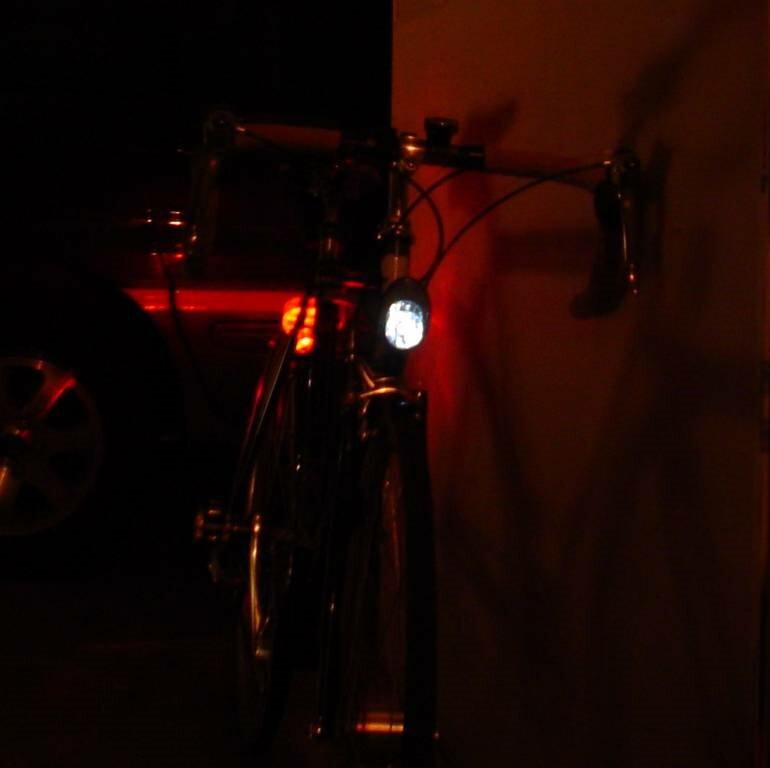 As clandestine as I try to be as a cyclist, there is just no getting around it. We look weird. Among the cattle ranchers, grain farmers, townsfolk, and Harley riders refueling their bikes, we stood out. Today especially, Robert’s trike was quite an attraction, as it gathered up more than a few passing glances from passersby, and Bill’s gorgeous Woodrupp fixxie with it’s SpeedBlend tires was a close second for attention-getting style. Thankfully, my Kogswell is a little understated – not that it matters as I was still resplendent in my lycra and bright yellow wind-vest. I’ve long since reached the point where I really don’t give a hoot what’s thought of me – it’s just more humorous than anything, like we’re aliens that have landed at the Kwik Mart. Crazy. A chocolate milk and a Mounds bar later, and I’m ready to hit it again. First, Bill flips his rear wheel to freewheel-mode for the trip back down the monster hill. A wise move – sometimes coasting is more fun. We made our way northbound, and out of Baldwin City, past the water towers again, and down the monster hill that we’d climbed only 30 minutes before. Unfortunately, there was a little headwind now, but not enough to keep speeds out of the 40 MPH range as we tore up the road on our way back to DG-460. That was probably the best part of the day, the reward of that downhill run, and making it even better the traffic had lightened up a little bit. The day was really shaping up, and warmers and wind-vests came off and were stowed away as the sun got higher in the sky and the brisk breezes stirred up the warmth and poured it into the valleys and shadowy spots on the roadside. MAN – I have often written about the sweet smells of fall, and the glory-days of summer – but THIS here was the best. The new birth of life from the trees, the water flowing in the brooks once more, the birds alive with song, and the crystal-blue skies loaded with sunshine so intense it seems like you hadn’t felt sunshine in months – because you really hadn’t. The feel of bar-tape under bare fingertips, wind filling your ears unshielded from winter caps, a zippers-pull to relieve some of the heat of your efforts, feeling the heat on your arms and peeling back the arm-warmers, the feeling of warm air flying past your legs, the smell of sunscreen filling your nose for the first time in months. Spring is alive, and finally here, and here we are in the thick of it, on this lonely rural byway. Robert, Bill and I continued east on N900 Road, eventually crossing into Johnson County again, where the pavement turns back into 143rd street – with no fan-fare, other than the passing again of the tractor graveyard and the posted warnings not to divide or develop land without a permit. The morning’s passion for spring continued as we came upon a large caravan of motorcycles, easily 50 of them heading westbound into the bright day – with a fist of solidarity in the air, we all exchanged waves: it was a good day to be out, and we all probably felt sorry for anyone trapped in the confines of a car. Wind in the hair, whether human-powered or Honda-powered was okay by me. After a few more miles, we caught back up to K-Man and Akil, making their way back east after creating their own turn-around – my bad. Still, they were happy to be along, and really enjoying the day – we regrouped for a short time and made our way onto Dillie Rd, and eventually back to 151st Street for the final run back towards Oregon Trail Park to the east – this was the toughest part of the ride: all the hills that were simply ignored so early in the ride were here to remind us of their presence, and remind us of the nearly 50 miles in our legs already. “Who put these hills here?”, “was this here before?”, and “is this the right road?” are common responses, and the trip up 143rd back towards Robinson is even worse – but, it’s over in due course. 54 miles in, and a lot of sunshine and smiles – we are finished, and happy to be so. It was a good day for scenery, and a good workout, too. Spring, baby – in full effect. I can’t wait until the 15th, and our Cidermill ride – always a classic! I hope everyone got a chance to ride this last weekend. It was nearly perfect, and a great time to be a cyclist. Let me just go on record: this is a fantastic bicycle, and I honestly think – although many have heard it before (namely my wife) – that this may fit the primary bicycle role in my stable for a good many years. Simply fabulous – Matthew, if you are reading this, thanks for a superb product! The saddle height needs a little more of a lift, as I still feel – although it’s diminished since the previous ride – a little knee twinge. A couple more mm, and it should be perfect (24 hours later, it is.). I think a more appropriate saddlebag is in order, and perhaps a handlebar bag for those brevets would look nice, just a small one. Other than that – could I actually be DONE wrenching for this season??? Possibly so --- time to just RIDE. Whew!